Srikakulam, Vizianagaram, Visakhapatnam, East Godavari, West Godavari, Krishna, Guntur, Prakasam, Nellore, Chittoor, Kadapa, Anantapur, and Kurnool. 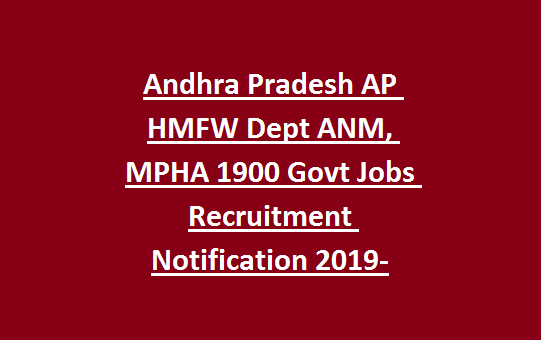 MPHA Female course completed candidates eligible to apply for this AP HFW recruitment 2019. 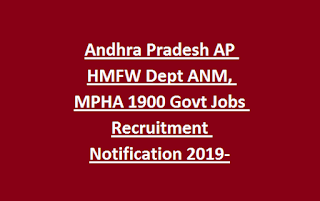 There are total 1900 ANM/MPHA vacancies are in this AP HFW Depr recruitment 2019. Candidates selections will be based on merit in qualifying exam and documents verification. Candidates must have submit their application form to their respective DMHO office of their own district on or before 20-02-2019. Application form is available to download at http://cfw.ap.nic.in/. Detailed recruitment process about this ANM Jobs of AP CFW is updated below. There are total 1900 posts are in this AP Commissioner of Health Family Welfare Dept recruitment ANM or MPHA Female. Upper age limit as on 01-02-2019 is 42 years. Age relaxations are applicable for SC, ST and BC candidates. SSC qualification, 18/24 Month’s MPHA Female Course or Two years Intermediate Vocational Multipurpose Health Assistant female Course. And must have completed 1 year clinical training in any Government Hospital. Rs.300/- to be paid through DD in favor of Commissioner of Health & Family Welfare, AP, Gollapudi, Vijayawada, Payable at Vijayawada. No fee for SC, ST and BC Candidates. Based on merit in ANM/MPHA Female course candidates will be shortlisted for documents verification. Short list will be prepared based District wise only. Download application form from official website of http://cfw.ap.nic.in. Submit the filled application form along with all required documents to your respective District DMHO office on before 20-02-2019. Applications are accepted in DMHO Office only.